Q. How can I sign up for the RAVE Alerts? How can I sign up for the RAVE Alert system? 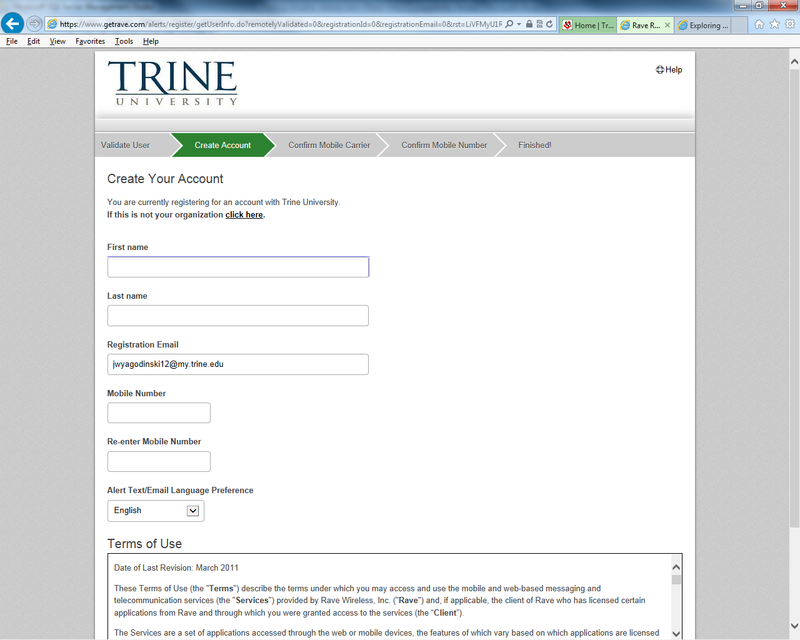 Trine University partners with Rave Alerts to deliver text and email messages in emergency and information situations dealing with our campuses. We ask that each of you take a few minutes to register your cell phone and/or email address with this service so you will be able to get necessary information during emergencies, severe weather or internet/email outages. Follow the instructions on the screen to register/login and sign up for the alerts. You must actually confirm your mobile phone to be able to take advantage of all of the Rave features. If you want to just receive email alerts, you can add the desired email at the My Account tab.